be thankful unto him, and bless his name." Sunday Services 10:30 a.m. and 12:30 p.m.
Saturday Service (Bilingual) 6:30 p.m. The Cathedral of Saint Matthew welcomes people of all races, nationalities and religious denominations. Whether you have gone to church all your life or have never set foot in a church, we hope you feel comfortable here. 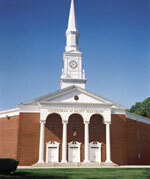 Our worship services include music, Bible inspired teaching, homilies and sermons. Baptisms are celebrated, on occasion (either by immersion, pouring or sprinkling). Each Sunday and Thursday, we celebrate the Lord’s Supper or Holy Eucharist. Prayer is offered by the clergy for healing and blessing. 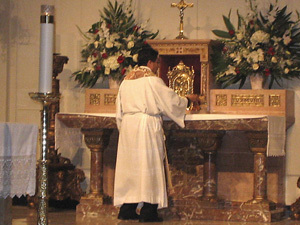 For those desiring it, personal prayer is also offered on an individual basis by the clergy. 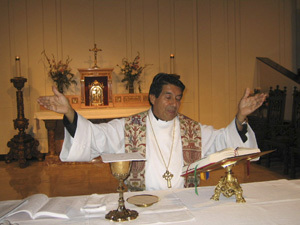 For more information, please read "What is Liturgy?" The clergy of the Cathedral of Saint Matthew are available to officiate at weddings and funerals and to make visits to hospitals, jails and homes. Our clergy do not accept additional compensation for their services in these areas because, as clergy, they have been called to serve, not to be served.